Captain James Rogers hails from Pompano Beach Florida. His very first job was fishing on a boat. He got his captain's license immediately after turning the legal age of 18 and at that point had more experience than most fishermen three times his age. His hobbies include fishing, fishing and fishing. He even fishes on his days off! Customers willI tell you it makes a difference having a captain who loves to fish and doesn't just see it as a job. In addition to charming all the single ladies in Key West Florida Captain James likes to run his crab traps for personal consumption. 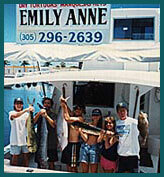 He moved to Key West to run overnight charters and catch more fish. In his last position he ran a party boat out of Pompano Beach. He loves running private charters with six anglers where he gets to know his customers and he likes the more fertile fishing grounds where it takes more than one day to fish. James is 25 years old and has a very loyal following. We had a great time last weekend in spite of the nasty rough crossing at the end. James was great. I'm writing to ask you to remind him to email the pictures he took. Everything was great ! The only negative was how quickly the time flew by. Captain James is great. He's a hard worker who constantly searched to put us on fish. He is not just a captain, he is a fisherman who is willing to share his wealth of knowledge to insure us a bountiful trip.